This walking trail is a beautiful half-day trek to the 150-ft-high Gan Ella waterfall. At first, you will walk along a path created by elephants and the other animals on the high hills from which you will see beautiful scenery over the Pallewela village and cultivation areas surrounding it as well as all way to the Nagrak mountain range and to the famous Horton Plains National Park. The trekking path will take you through dry grasslands (this type of vegetation is called “Dry Patana”) before steeply descending to a local farm, where you will see a traditional tree house that the farmers use for keeping an eye on their cultivations and protecting the crops from wild animals. From the farm, the trail continues along a river surrounded by humid sub montane forests. When arriving at Gan Ella, you will first reach the upper point of the waterfall, where you have the breathtaking views over the waters tumbling down. The small path will lead you very steeply down (watch your step as the rocks and fallen leaves might be very slippery) to where you can see Gan Ella in all its beauty and have a swim in its fresh waters. Our trekking guides are there to help you make the descent and the ascent here and at any other place where help is needed. Enjoy the view and have a little snack, before taking the same path back to the farm and then a small road that leads you to the Mulgama village, near the campsite. 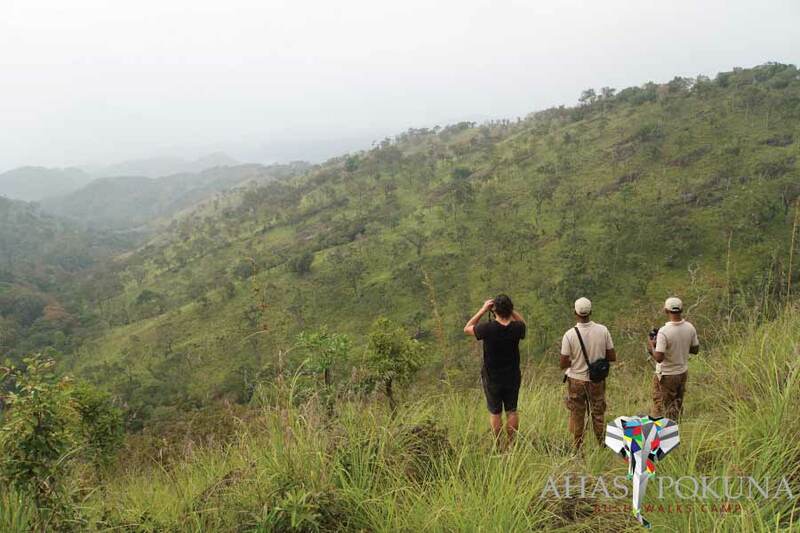 Meet and greet the locals, before taking a path ascending through the forest back to Ahaspokuna Bush Walks Camp.